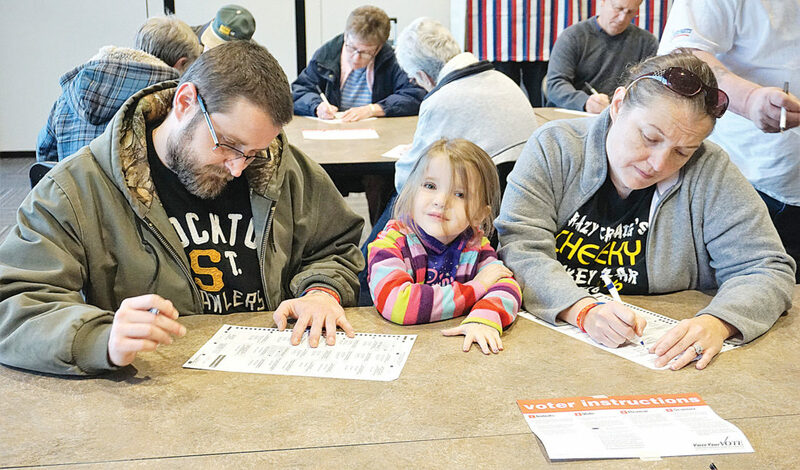 Jill Schramm/MDN Josie waits patiently between her parents, Johnny and Larae Guess, as they mark their ballots during early voting at the Ward County Administration Building Tuesday. Tuesday will be the final day to cast ballots in the general election, which will decide a number of state and local races. Polls will be open from 7 a.m. to 7 p.m. in Ward County. All Minot voters will vote in the armory, located in the east portion of Minot Municipal Auditorium. City buses will be providing free rides to the auditorium. Ward County polling places are: Afton, Our Savior Lutheran Church; Berthold, Senior Citizens Center; Burlington, City Hall; Harrison, Ward County Administration Building; Kenmare, Memorial Hall; Nedrose and Sundre, State Fair Center-All Seasons Arena; North Central and Ruthville, Faith United Methodist Church; Sawyer, City Hall; Surrey, City Hall. Residents in the precincts of Des Lacs, Makoti, Ryder and South Prairie can vote in the Ward County Administration Building on election day as an option to returning mail ballots. Acceptable forms of voter identification are a driver’s license, nondriver’s identification card, tribal government-issued identification or long-term care certificate provided by a North Dakota facility. If information is missing or incorrect on the ID, supplemental documentation, can be provided, such as a utility bill or bank statement. Jill Schramm/MDN Voters pick up and mark their ballots during early voting Tuesday in the Ward County Administration Building. If an individual is unable to provide a valid ID or supplemental documentation, the individual’s ballot will be securely set aside and the individual can return to the poll with the information or will have six days to provide valid identification to the county auditor. Once the information is supplied to the auditor, the set-aside ballot can be counted by the canvassing board. The Ward County Canvassing Board will meet Nov. 13. As of Saturday, the North Dakota Secretary of State website reported 106,551 voters had already cast ballots. That included 5,352 early voters and 4,752 return absentee and mail ballots in Ward County. Nearly 81 percent of ballots mailed in Ward County have been returned. The top race on the ballot getting both local and national attention features Sen. Heidi Heitkamp, D-ND, and challenger Congressman Kevin Cramer, R-ND. In the U.S. House race, candidates are Democrat Mac Schneider, Republican Kelly Armstrong and Independent Charles Tuttle. 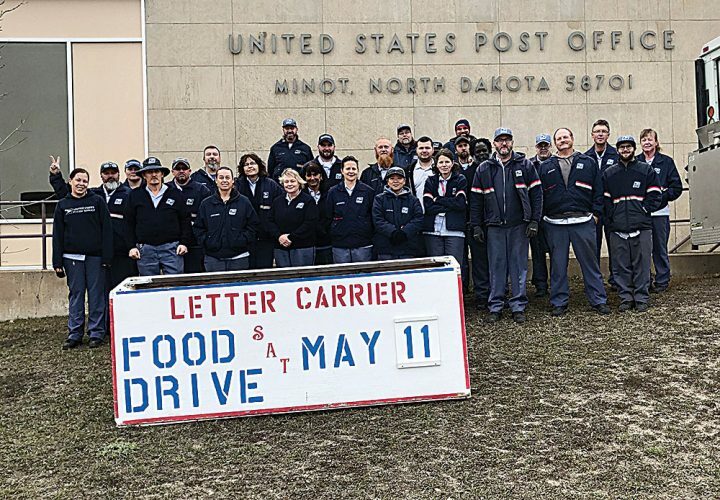 Minot’s District 5 and the Minot-Surrey District 3 have legislative races on the ballot this cycle. In District 3, Republican Oley Larsen is being challenged for his state Senate seat by Democrat Joseph Nesdahl and Independent Andy Maragos. The House candidates are Democrats Bob Schwartz and Shannon Krueger and Republicans Jeff Hoverson and Bob Paulson. 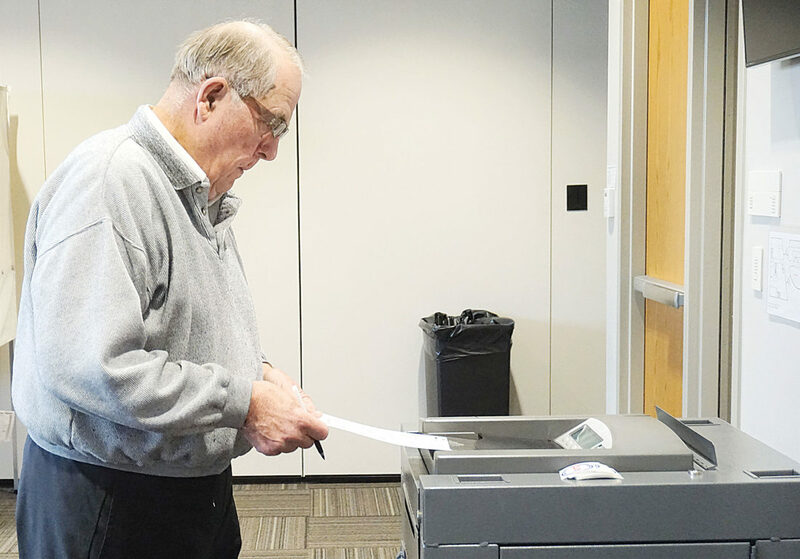 Jill Schramm/MDN Orlan Rovig slides his ballot into the voting machine in voting early at the Ward County Administration Building Tuesday. In District 5, Republican Randy Burckhard is being challenged for his Senate seat by Democrat David Grimes Haugen. On the House side, Republicans Scott Louser, an incumbent, and Jay Fisher face Democrat Zachary Raknerud. Running for two seats on the Ward County Commission are Dave Pankow, John Pietsch and incumbent John Fjeldahl. Minot attorney Andrew J. Schultz is challenging incumbent Rozanna Larson for Ward County state’s attorney. Bob Barnard, who holds the Ward County sheriff’s position by appointment, is challenged by another law officer in the department, Robert Roed. Also on the ballot are soil conservation district supervisor, Patrick Allen Zeltinger; Garrison Diversion Conservancy District director, Alan Walter; and official county newspaper, Minot Daily News and The Kenmare News. 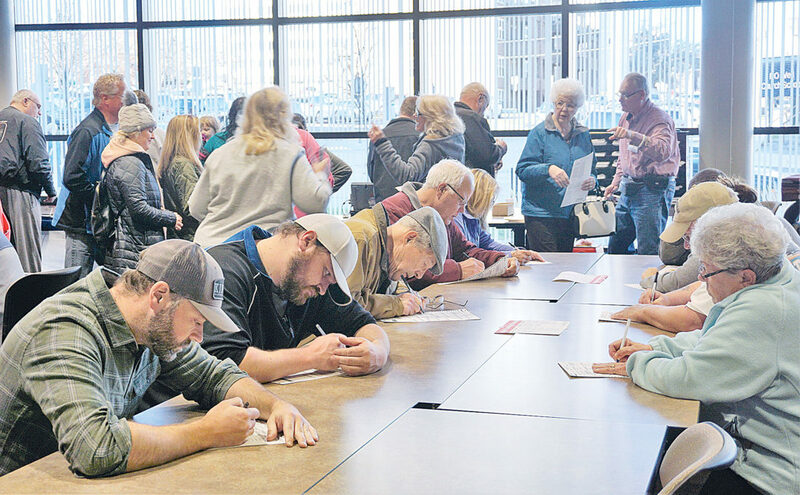 Some other counties where voters will be deciding races include Bottineau County, where Douglas Marsden and incumbent LeRoy Rude, both Bottineau, are running for county commission in District 1. In Burke County, Matthew Kihle and Richard Owings, both Lignite, are vying for county commissioner in District 2, and Sheriff Jeremy Grohs is being challenged for his position by Shawn Brien. In Divide County, Sheriff Lauren Throntveit of Crosby is challenged by Zachary Schroeder of Noonan. Larry Haman and Vern Kongslie, both Towner, are running for the District 5 seat on the McHenry County Commission. Haman is the incumbent. Mountrail County has a race for its District 2 commission seat, where Joan Hollekim and Rand Olson, both Stanley, are running. 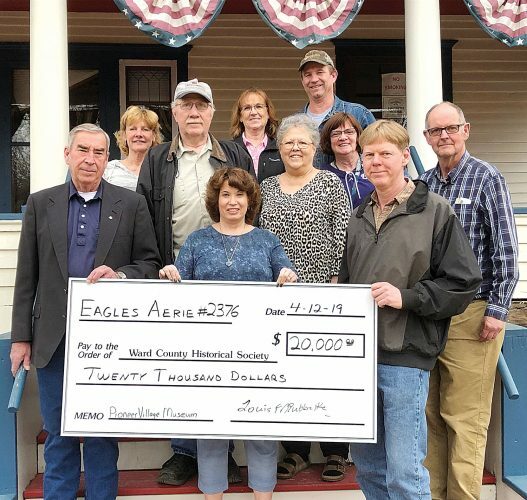 County Auditor Stephanie Pappa seeks to retain her position in a race with Mary Trahan, and Jessica Niemitalo is challenging incumbent Shena Wold for county treasurer. Corey Bristol and Duane Marmon are seeking the open sheriff’s position. Pierce County’s ballot includes incumbent Mike Brossart and Kate Halvorson, both Rugby, as candidates for the county commission from District 1. Renville County races feature Richard Cameron and incumbent William Stanley Sr., both Sherwood, in a race for the District 1 commission seat. In the county recorder race, incumbent Jerene Bender is challenged by Danielle Petersen. Bill Cox and Roger Hutchinson are running for sheriff. Among races in Wells County is the sheriff’s contest, where Sheriff Christopher Kluth and Fessenden Police Chief Travis Tesch are candidates. Kluth has been serving in the position since former sheriff Johnny Lawson resigned last year. Lawson had faced multiple felony drug-related charges but pled guilty and was sentenced on misdemeanors. – Secretary of State, Democrat Josh Boschee and Independents Michael Coachman and Alvin Jaeger, who is the incumbent. – Attorney General, Republican incumbent Wayne Stenehjem and Democrat David Clark Thompson. – Agriculture Commissioner, Republican incumbent Doug Goehring and Democrat Jim Dotzenrod. – Public Service Commissioner (6-year term), Republican incumbent Randy Christmann and Democrat Jean Brandt. – Public Service Commissioner (two-year term), Republican incumbent Brian Kroshus and Democrat Casey Buchmann. – Tax Commissioner, Republican incumbent Ryan Rauschenberger and Democrat Kylie Oversen. – Supreme Court Justice, incumbent Lisa Fair McEvers and Robert Bolinske Sr. Judges Richard Hagar and Stacy Louser are running unopposed for re-election to the bench in the North Central Judicial District. – Measure 1, a constitutional change pertaining to lobbyists, conflicts of interest and the creation of an ethics commission. – Measure 2, a constitutional change to state “only a citizen” rather than “every citizen” is a qualified elector. – Measure 3, a statutory measure to legalize marijuana and expunge criminal records of prior offenders. 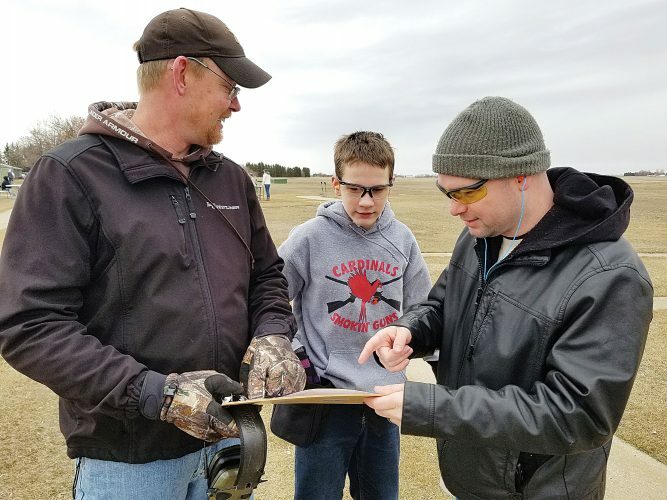 – Measure 4, a statutory change to provide free, personalized motor vehicle plates to volunteer emergency responders and allow the plates to serve as an entrance pass at North Dakota state parks. Eloise Ogden/MDN A 1910 Avery Tractor/Gasoline Farm Wagon shown in the Iowa 80 Trucking Museum is one of only six Avery trucks known to still exist and one of the oldest trucks in the museum. It was advertised to do the work of six to eight horses and could haul up to 100 bushels of wheat, pull a three-bottom plow or even run a threshing machine through an additional belt pulley. Ashton Gerard/MDN Area residents flocked to the North Dakota State Fair Center for the 43rd Annual “The Big One” Christmas Show featuring crafts, goods and treats from local sellers. The event showcased 430 booths and over 250 exhibitors selling their goods, many with a special hand-made touch. The show started on Friday and concluded Saturday from 9 a.m. to 5 p.m.
Eloise Ogden/MDN Many think electric-powered vehicles are a new idea. This 1911 Walker Electric Model 43, displayed in the Iowa 80 Trucking Museum, was a milk delivery truck in downtown Chicago. A single charge would allow this truck to travel up to 50 miles. The Walker brand, native to Chicago, was in production from 1906-1942, longer than any other electric truck in the U.S.